than necessary. Taking steps that reduce risk exposure will certainly improve your prospects of lessening the increase, or potentially lowering your current premium. Risk management strategies put into action in the workplace are viewed favourably by insurers, and should be a matter of priority anyway, so it’s win-win in many cases. Lastly, under these market conditions there will be offers that appear “too good to be true”, which will tempt consumers to switch products. Avoid getting caught with an inferior policy by reading and understanding the fine print in the PDS. Not all policies are made equal, so talk to a broker who can give you the right advice and minimise your exposure. Craig is married to Jacki and they have two lovely daughters. Craig loves his lawn bowls and helping business owners to connect. Shooting Star This describes a business that shoots to the top so fast you are overwhelmed and don’t have the right resources in place to adapt. This can also happen from being overwhelmed by small clients and not taking the time to find large clients, which will sustain your business after the small client sales slow. In order to catch the big fish, you need to believe your company can make a difference with theirs. It’s easy to get into the thought that a large company doesn’t need anything from a small business like yours, but this is entirely wrong! Once you take a look at how big companies operate, it’s important to know which ones are the best fit with your company. One of the best ways to get in the door is by knowing someone on the inside who can put in a good word for you. If you’re not sure where to start and feel a little intimidated about catching big fish, try our FREE test drive to get help from our amazing business coaches. record. Cash Flow Coaching Kit With all of the above in mind the ATO are currently testing a Cash Flow Coaching Kit which may be useful to some small businesses. If you think this could be of interest to you, ask your Bookkeeper or Accountant if they can find out more and when it might be available. 50% in the next three years. I can refer you to exceptional property experts to get the most of your projects and we endeavour to always work in your best interest to find you the right loan solutions tailored to your specific needs and requirements. your business look completely professional, well established and successful. Photographers always keep their equipment and software up-to-date, as well as always learning new improves skills within the trade. This is all to make you, our clients, look as amazing as possible. Photographers seldom work for themselves; we service you. It is our job to make you and your business look amazing. We do this through all the different techniques and equipment we have available to us in the form of things like: a portable studio that can come to your business, lighting to bring out detail or create wonderful tonal moods, cameras that capture the highest definition currently available, and computer software to enhance and style every image; taking them from a simple photo to something that wows your clients and gives you the very best business image. 2019 is a New Year and naturally you have many ideas of what you want in the next 12 months. Make sure that you include updated photography on your priority list! into aged care was established on Monday, 8 October, 2018 and the Commissioners are required to provide an interim report by Thursday, 31 October, 2019, and a final report by Thursday, 30 April, 2020. Grant Hutchinson, serving as director of an Aged Care Facility, notes the Royal Commission will be placing webcasts of their hearings online (https:// agedcare.royalcommission.gov. au/hearings/Pages/Webcast.aspx) and has watched the opening of the Royal Commission held on Friday, 18 January, 2019. He also expects to personally attend the hearings conducted by the Royal Commission into Aged Care Quality and Safety in Melbourne. $2b business loans fund hits parliament FINANCE Rebecca Gredley The federal government’s $2 billion plan to boost the funds available to smaller lenders has hit parliament. Under the draft laws, small and medium-sized businesses will be able to borrow money at more competitive rates through a new Australian Business Securitisation Fund. “This bill seeks to increase competition in the SME market by unlocking securitisation funding for small lenders, which will allow them to compete more effectively against the major banks,” Treasurer Josh Frydenberg said as he introduced the legislation to the lower house on Wednesday. Keeping your stuff safe: tips for intrepid travellers TRAVEL (KnowRisk)	Keeping your stuff safe is a pretty important part of any good trip, and regardless of where you are travelling – whether it is in a familiar place or a vastly different culture – you tend to be more vulnerable and can become a target for thieves and scammers. There’s no need for paranoia, but you don’t want to be too complacent either. Here are some simple things you can do to help keep your stuff safe. 1. Don’t put all your eggs in one basket Split your valuables among different bags and even in different places throughout your bag – particularly if you are carrying a decent amount of cash. This means if one bag does get stolen, you wont lose everything. Make sure you carry a photocopy of your passport separately to your actual passport. public places like bus stations or on There are a lot of genuine people out there, but a lot of the time you will trains. be expected to pay, and you are also opening yourself up to potentially 3. Lock up Cable locks are invaluable when having your luggage rummaged travelling. Use them to lock your bag through. Think about what you want to a heavy piece of furniture or to lock them to the seat or luggage rack when stowed away on buses and trains. It travelling on trains. This makes it just is better to have the majority of your a little harder for would-be-thieves to valuables with you and in sight rather than under a bus or on a luggage rack carry your stuff off. Take a padlock to use if you that you cant see. have a locker in your room, or to lock cupboards. It may even come in handy 6. Save your pics One of the most upsetting things as an extra lock for the door of your room – you never know who else may about losing your stuff is losing all have a key! Go for a combination lock your photos. Your camera is certainly rather than one with a key, you don’t replaceable, your photos not so much. want to have to worry about losing Back your memory card up regularly and keep the backup separately to that as well. your camera. 4. Pack it away When you leave your room, 7. Swim time resist the urge to leave things lying out Going for a swim can be tricky, all over the place. If things are packed particularly if you’re on your own. Even away in your bag, it is less easy to grab if you’re with friends, a waterproof something and run. This also means wallet can be an excellent way to carry your valuables aren’t out and about on a bit of cash with you when you hit the display. beach. 1. Computer and mathematical Technological disruption is here to stay and with it comes a lot of data for businesses and the public sector to analyse. Although automation can take over a lot of data crunching, there is still likely to be strong demand for data analysts who can bring a human element to the story data is telling us. Information security experts, software developers and programmers will continue to be in demand for their ability to harness technology and data and protect us from it too. of human capital and the rise of remote working, teams are becoming increasingly diverse and distributed. Put this together with the rapid pace of technological development and you get a complex set of challenges for managers to take on. Skilled leadership is going to be more important than ever as organisations seek to grow and prosper during periods of transformation and in uncertain times. specialty, such as finance, conveyancing, pest or build inspections along with a range of additional professionals. The Buyers Agent can liaise with all these professionals to allow you minimal time absorption and present the key information to you in brief but with capacity to fully explain. The most common mistake property buyers make is thinking the vendors or sellers Estate Agent is working for you. Right from the moment you either meet, speak or email, the Estate Agent is trained to commence a selling process with you. They are gathering information from you which they use during negotiations. They may also be engaging with your children to subliminally assist them. Estate Agents may ask the kids, “Which bedroom will be yours” so the kids tell their parents they want the house. These questions are designed to give them an unfair advantage over the buyers. As I said earlier, they’re working for the Seller and in most cases today received comprehensive training to get the best result for the seller. That’s their job! In 2019 buyers deserve the benefits that purchasing through a Buyer’s Agent. Australia’s Real Estate model is designed to protect the seller and unfortunately as it states in legislation “Buyer Beware”! It has never been a more important time in property to have the buyer’s represented too. Preferred Work Location: Sydney	Desired Salary: $10,000 Phone: 04 4354 2165	Email: johnsmith143@bigpond.com.au Professional Overview: A strategic leader with a progessive career of 20+years. Providing the vision and direction needed to achieve accelerated and sustained growth whilst decreasing costs. Strong exposure to Australia and Asia Pac markets including Singapore. China and Korea. Demonstrated versatility to quickly transition across differing market sectors such as IT&T. Tourism and Advertising. 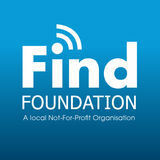 Are you Non-For-Profit in the Maroondah area? Advertise your events for FREE on the following pages. Central HUB with children’s activities, photo moment, silent auction and information. Various photo moments spread throughout the course. Roving staff selling merchandise and raising awareness. Brand Ambassadors //will be roving a designated section of the course, with shaker tins and QUEST machines, collecting donations, selling raffle tickets and raising awareness for My Room. Podium Activations Assistant //located at various points around the Grand Prix course, a team of two volunteers will be assisting with any queries or help the general public needs in taking photos and using the My Room hashtag. *please note: all roles will be assisting with money handling – volunteers must be comfortable with this. You will be allocated to a team of 3 to 4, but will also need to work independently if required. If you have any friends or family that would like to volunteer with please pass this letter on to them. Unfortunately due to safety policies and the wellbeing of all participants all volunteers must be a minimum age of 16 years old. We are looking for volunteers who are willing to work a minimum of 2 shifts across this four-day event. As rostering is a large process we ask that you are flexible in your availablity and to please outline in your registration if you are available on short notice, as additional shifts may become evident at very short notice. Upon arrival you will be supplied with a t-shirt and a volunteer pack. We ask that you wear black pants or black skirt and comfortable walking shoes (please do not wear loud and brightly coloured shoes). Formal shorts are acceptable in hot conditions, please no denim, active-wear, ripped or faded clothing. If you would like to be part of the 2019 Melbourne Grand Prix Volunteer Team for My Room, please complete the application form via the link below, before Friday 22nd February 2019: https://drive.google.com/open?id=1pTzWymFi5BNig1YJpHZTr9KVFhIi4yhw2QzO5_tRkps Thank you for your interest in volunteering with My Room at the Forumla 1 Rolex Australian Grand Prix 2019. We will be in contact towards the end of Febraury with further updates, and look forward to making this iconic Melbourne event a memorable one for you and My Room. • Watch and read the clues Each month we will provide clues in the location of the Find Cache. Once you found the Cache please notify us. 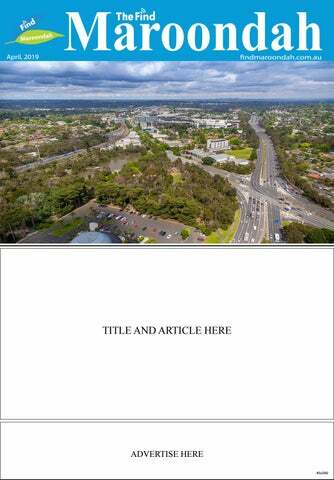 • Share your experience The winner will be published in the next Find Maroondah.